Nipsey Hussle has died at age 33. The rapper passed away on Sunday afternoon after being shot outside of his clothing store, Marathon Clothing, in Los Angeles, TMZ first reported. 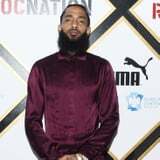 Nipsey was rushed to a hospital, where he was pronounced dead, and police say two other people were wounded by the burst of gunfire, according to the LA Times. On Sunday night, The LAPD tweeted that it is conducting an investigation to locate the suspect and anyone else involved. The hip-hop artist was nominated for a Grammy for best rap album in 2019 for his debut studio album, Victory Lap. He is survived by his two children and his longtime girlfriend, actress and model Lauren London.